Optional HOT HIIT® teacher training offered the first 2 days at an additional cost. Must complete self-study before training. 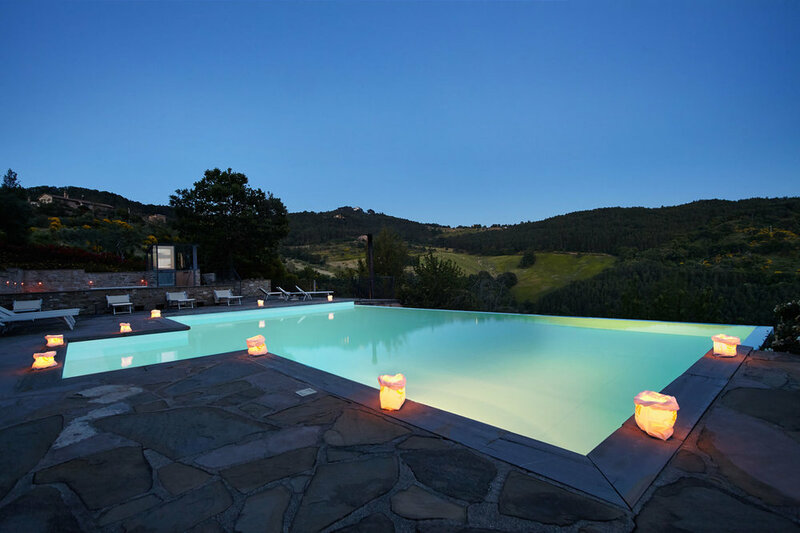 Spend 7 beautiful nights in the peaceful rolling hills of Umbria at Locanda del Gallo Country House, located between Gubbio and Perugia. Wake up to a daily meditation. Take one HOT HIIT® and one yoga class per day in the heated 1,200 square foot yoga room overlooking the Italian countryside. Enjoy hikes, gardens, extreme relaxation, a saltwater pool, sauna and jacuzzi. Enjoy 3 healthy, organic meals per day that includes tomatoes, herbs and vegetables from the kitchen garden, olive oil from the olive grove, and homemade yogurt, cakes and breads. See the countryside while participating in a winery tasting and lunch. Visit the medieval hill town of Gubbio on their very special Market Day, and while there tour their Roman Theater dating back to the 1st Century. Enjoy a 10 minute walk to a local weaver and learn the art of hand looming and dyeing fabric with vegetable dyes. Partake in a regional Italian cooking class with a private chef. Enjoy a day trip to the ancient town of Perugia, known for its love of chocolate and its numerous boutiques, cafes, restaurants, and bars. Get certified in HOT HIIT® during an optional 2 day intensive training (additional $595). HOT HIIT® is pleased to host this magical retreat May 25th through June 1st, 2019 led by founder Monique Crous. Monique is a certified yoga teacher, as well as a certified NASM personal trainer. The retreat will include one meditation, one HOT HIIT® class per day, and one yoga class per day, all taught by full time veteran NYC instructors. Monique Crous is an NASM Certified Personal Trainer as well as a certified Bikram Yoga instructor. She went to Bikram Yoga training in 2008 and taught at Bikram Yoga NYC, now Bode NYC, until 2012. In 2013, she opened up her own studio in downtown Manhattan. While there, Monique created a group fitness class that today is known as HOT HIIT®. Monique has trained over 80 instructors all over the USA and Canada, and is committed to spreading this effective, fun, and challenging class all over the world. Olivia has been practicing yoga since 2002. Her interest in yoga began with a physical practice when she was looking for a way to move her body and feel good. She never expected that it would change her life! It took only 6 months after beginning her practice for her to make plans to become a teacher. Olivia has completed the 500-hour Bikram teacher training and 200-hour Vinyasa training, along with numerous continuing education courses. Beyond the physical, Olivia has devoted herself to the entire art and science of yoga. She is most interested in how the ancient teachings and philosophies apply to modern living. Shakiem has been performing professionally since the age of nine as an actor, dancer, and singer on Broadway, film, and television. While touring across the USA, Shakiem started practicing yoga to protect his body from the physical demands of dancing. Shakiem took his first HOT HIIT® class at Bode NYC and fell in love with the movement. He found HOT HIIT® to be a great compliment to his yoga practice. He noticed that with the strong core he developed from HOT HIIT® classes, his yoga asanas were improving greatly. Shakiem knew he wanted to share this very special movement with as many people as he could. He became certified in HOT HIIT® at one of the very first trainings at Bode NYC, and has been teaching full time ever since. HOT HIIT® training will be held the first 2 days of the retreat. Self-study required before training. A personal 1 on 1 can be booked with Monique Crous at any time during the retreat. Additional ticket must be purchased in advance. All Pricing per person. No refunds unless we can fill your spot. We will do our best to do so! Alcohol(5 Euro corking fee for each bottle brought in. Bottles may be purchased onsite). Private airport transfer from Rome to Locanda del Gallo can be arranged at the cost of 280 Euros. Contact monique@thisishothiit.com for details. The most convenient airports are: – Perugia S. Egidio 15 Km. – Rome, Fumincino and Ciampino airports 200 Km. – Florence Peretola 170 Km. – Ancona Falconara 130 Km – Bologna Forlì 150 Km. By train The closest railway station is Perugia (Ponte San Giovanni) 20km from the Locanda. You can take the train from any of the above airports, then take a taxi from the railway station in Perugia to Locanda del Gallo. Taxi is about 50 Euros for up to 4 passengers. HOT HIIT® is a training system that combines Low Impact Interval Training(LIIT), High Intensity Interval Training(HIIT), muscle toning, and cardio, generally in a heated room. This practice burns fat and cre­ates long, lean mus­cle mass, with rapid results. It strengthens your core, improves cir­cu­la­tion, and increases flex­i­bil­ity. HOT HIIT® is per­formed on a yoga mat. It is paired with upbeat music, making it an energizing, fun, full body, beat based workout. There are modifications for every exercise, making HOT HIIT® accessible to all ages and fitness levels. Work mindfully and at your own maximum, whatever that is for you. This luxury, boutique hotel accommodation is immersed in nature. Enjoy green hills, gardens, silence, extreme relaxation in the wellness centre with salt water swimming pool, jacuzzi spa and massage facilities. Let their chef spoil you with healthy and organic cuisine. Gubbio, Perugia, Assisi and Cortona are all within easy reach of the Locanda del Gallo and even Siena, Florence and Rome are not too far.